- 22 September, Hamburg. NDR confirmed to us that there will be a concert by the NDR Big Band directed by Mike in Studio One of NDR in Hamburg-Rothenbaum. 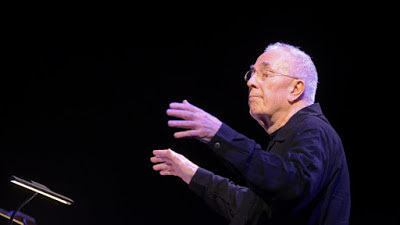 - 19 October, Boston, The main event in the US is a concert at Berklee in Boston October 19th, for which both Bill Frisell and Gary Burton will be performing. For Burton it will mark a very brief re-emergence from the retirement that he has recently announced. When I spoke to Mike Gibbs he was enjoying the task of planning programmes. "Some of the tunes I want to do are different for Boston - we'll do some of the recent album with Bill Frisell, Also And on the Third Day with Gary Burton and Bill - using a new approach which Bill's quartet came up with in a concert at the University of Washington (UW) in January 2016." Gibbs has also been re-working the arrangement of Eberhard Weber's Mauritius - that was originally written for the Weber 75th jubilee and issued on ECM. John Lewis' composition Django also came up in the conversation. Gibbs has fond memories of having been a student in 1960s and of John Lewis’summer school at Lenox, where Lewis had accorded him a very warm welcome and a feeling of acceptance. "After a recent listening session with George Foster on his ultra high quality gear, we'd listened to the original version and he commissioned an arrangement of it for this tour." Gibbs was also enthusing about the line-up of the UK big band, notably the inclusion of Henry Lowther - "Henry played in the very first big band I ever had in the UK,at a concert at Lancaster University in 1969." I will always be grateful to have had the opportunity to study with Michael Gibbs at Berklee in the 70s. His unique approach has made him one of the great innovators in composition. His widescreen approach to the bigband makes him a unique and important voice in jazz. When people ask me how I come up with 'those crazy ideas' I use with BANDZILLA, I say, "Well, I studied with Mike Gibbs" and they say, "That explains everything!"